​A Chuppi Todo Baithak (CTB) is a friendly conversation with 5 or more people on women’s dignity and menstruation. It is about breaking the age old silence around the basic biological need of menstruation, so that people become more aware about the connect between menstruation and women’s health. Menstruation is an issue that affects us all, whether you are a man or a woman. That’s why we all must get involved in breaking the culture of shame and silence around it. Goonj first talked about this issue more than a decade ago, while also parallely working on menstrual hygiene for women in far-flung villages of India with its ‘Not Just a Piece of Cloth’ (NJPC) initiative. 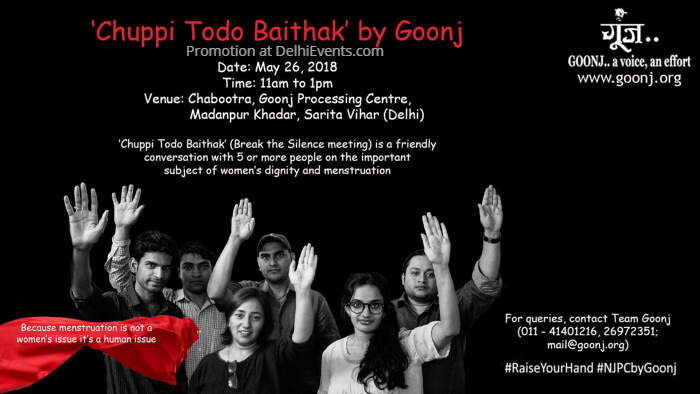 In the month of the ‘International Menstrual Hygiene Day’ (28th May) Goonj is launching ‘Raise Your Hand’ (RYH) Campaign among the masses for women’s dignity and a conversation on menstruation. 'Raise Your Hand’ for a human issue!! About the Organization : GOONJ (means an echo) is a multi award winning social enterprise working pan India to build an economic bridge between the cities and villages. Goonj started the NJPC (Not Just a Piece of Cloth) initiative in 2005, around a decade ago. NJPC is focused on opening up the most taboo and ignored subject of menstrual hygiene by involving the masses in generating an affordable cloth napkin. The NJPC programme is a nationwide intervention, which starts with providing a physical product but stresses more on changing practices and mindsets and behavioral patterns in the long run. MY Pad, Goonj's clean cloth pad is developed out of old cloth collected from urban masses. It is made with highly indigenous processes while talking to women about the related health and hygiene aspects..
Our aim is to spread global awareness about this basic need and get more people to talk about it, to break the taboo and shame around this natural process.